Teasels at Stanton Drew, in the Chew Valley, south of Bristol; 1 Aug 2013. For me, the diffuse darker area “anchors” the shot, helping to push the subject out towards us; and it also displays the thorns on the plant’s stem – and strands of spider’s web – to greater advantage. You can find an earlier and differently presented Stanton Drew Teasel picture here. There is also one from the Somerset Levels here. Both will open in separate windows. Technique: D700 with 70-300 Nikkor lens at 300mm; 200 ISO; Silver Efex Pro 2, starting at the Landscape preset. Back to the blinding light of deep summer! 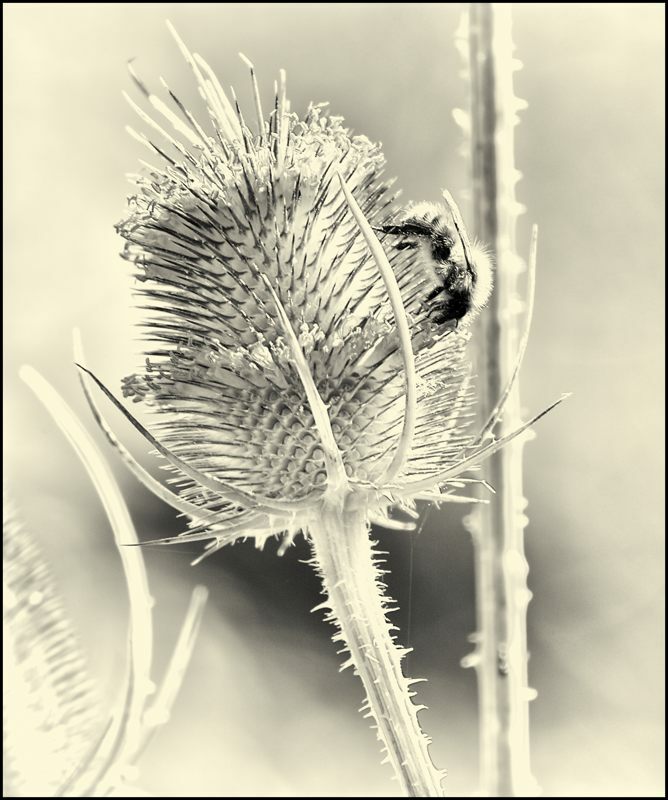 Teasels are good subjects, aren’t they? I like the shallow depth the 300 gives you. Nice work! Looking as balletic as ever 🙂 Love the processing. Looks as if a lot of teasels will spring up in the garden this year – they might take over everything else! Ah, balletic … and not to forget parasol … and not to forget others that have already been forgotten … “Remember me, I have forgotten you” … no, that’s Dylan Thomas … “My knees have just gone all unnecessary” … yes, that’s me …. 🙂 …. those hazy lazy days summer. Yes, just now they seem very far away!